The Bayside Marina houses Charlie's Quarterdeck Lounge, a great facility with a beautiful view of Monroe Bay. The room is named in the memory of Dockmaster Charlie Robertson. Suitable for up to 55 guests, this room is perfect for gatherings such as birthday parties, meetings or many other special occasions. I recently attended a baby shower here. It was a wonderful, fun-filled event and this was a perfect spot to hold the gathering. It was a hot day and the air conditioning kept the room quite comfortable. One end of the room has Men's and Women's restroom facilities, plus a simple sink and mirror in the corner if you just need to rinse your hands or check your makeup. There's also a sliding glass door in this area that leads to an outdoor deck with some chairs and a staircase leading down to the boat dock area. The other end of the room contains the entry staircase, a large screen television as well as a kitchenette and a storage closet. The kitchenette has a sink, microwave, countertop prep area and a refrigerator. The rest of the carpeted room is filled with nautical decor and many windows, making for a bright, cheerful space. The vaulted ceiling adds an extra bit of height to the room. There are fans installed along the ceiling to help keep the air circulating. The views from here are breathtaking! 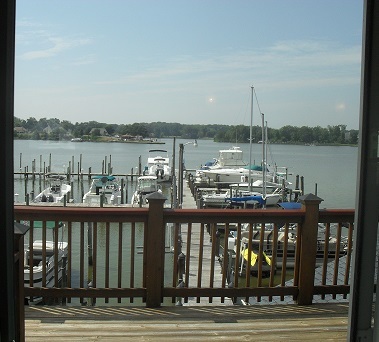 Looking out the windows on the bay side, you can see all the boats docked in the marina as well as the sparkling waters of Monroe Bay. Step out onto the observation deck for an even better view, along with a breath of fresh air. If you are in need of catering services for an event held here, this can be worked out with the Lighthouse Restaurant which is located just below on the first floor. You can also use your own caterer, just be sure to work this out with the lounge's agents. Please note the facility is accessible only by stairs, so keep this in mind if you are holding an event where guests with special needs might be in attendance. There is a trolley stop on site.